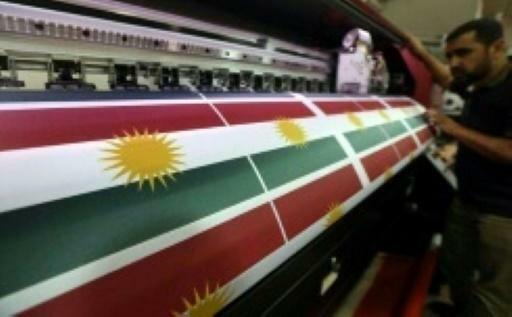 An Iraqi prints Kurdish flags in the regional capital Arbil ahead of an independence referendum planned for September 25, 2017. Baghdad - Iraq's parliament voted on Thursday to sack the governor of oil-rich Kirkuk over his decision for the northern province to vote in a Kurdish independence referendum opposed by Baghdad. Parliament speaker Salim al-Juburi said he had received a letter from Prime Minister Haider al-Abadi's office calling for MPs to vote on the dismissal of the governor, Najm Eddine Karim. The Iraqi parliament earlier this week voted against plans by leaders of the autonomous Kurdish region in northern Iraq to hold the non-binding September 25 referendum. The planned vote has faced strong opposition from the federal government in Baghdad as well as neighbouring Iran and Turkey, which fear it will stoke separatist aspirations among their own sizeable Kurdish minorities. Critics of the vote, including the United States and the European Union and even some members of Iraq's 5.5 million-strong Kurdish minority, say it could distract from the fight against jihadists. Kirkuk -- a province contested by Baghdad and autonomous Iraqi Kurdistan and home to diverse communities, including Arabs and Turkmen -- decided at the end of August to take part in the controversial referendum. Iraq's parliament voted on Thursday to sack the governor of oil-rich Kirkuk over his decision for the northern province to vote in a Kurdish independence referendum opposed by Baghdad.